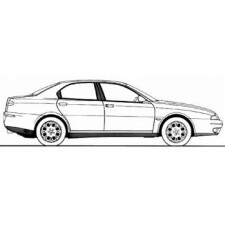 Alfa Romeo 166 first series. Dryer/filter for the a/c system applicable to Alfa Romeo 166. The unit is disassembled by a 166. It is a black cylinder in a metal clamp housing. Is m.. 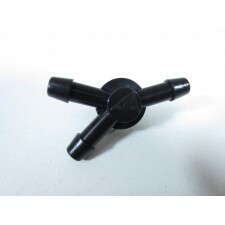 Mechanical valve for air conditioning system for Alfa Romeo 166. Submitted by a 166 of construction year 1999 with 2.0 16V Twin Spark petrol engine. T..
Airbag unit for the passenger side for mantage in an Alfa Romeo 166. This airbag unit is submitted by an Alfa 166 by construction year 1999. Manufactu..
AIRCO pipe combined aluminium pipe and rubber pipe part. The lead is in good, leak-proof. Submitted by an Alfa Romeo 166 2.0 TS of construction year 1..
Alarm siren for Alfa Romeo 166. Fabrieksysteem alfa romeo. The siren is mounted above the wheelhouse of the right rear wheel.Inscriptions on the unit:..
Back plate for mounting behind the grille for Alfa Romeo 166. The plate is in good condition and comes from a 166 of construction year 1999 universall..
Belt buckle; the part where the belt in the front passenger side snaps for Alfa Romeo 166. The belt buckle is attached to the Chair and this execution..
Belt buckle; the part where the belt in the front driver's side snaps for Alfa Romeo 166. The belt buckle is attached to the Chair and the implementat..